(0 Customer Reviews) | Write Review 12 issues per year If you’re looking for the best dog magazine on the market we think you’ve found it. Dogs Monthly is definitely not your average Fido when it comes to doggy reads. Packed with tantalising articles achievable training features and no nonsense advice it will warm the heart of every dog lover. Dogs Monthly is put together by people passionate about dogs who work with an enviable team of highly-respected trainers behaviourists breeders vets nutritionists and legal experts. We pride ourselves on giving the best and most up to date doggy advice so you can give your dog the good life he deserves. 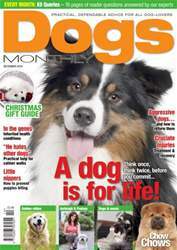 Dogs Monthly is bold fresh positive and vibrant filled with inspiring features fabulous reader offers fantastic competitions and plenty of opportunities to see your own furry four-legged friend on the page. It’s Britain’s fastest growing dog magazine and readers say they just can’t put it down. Come and join us and see for yourself. Aggressive dogs and how to reform them. Christmas gift guide for the special four-legged pal in your life. How to prevent puppies from biting. If you’re looking for the best dog magazine on the market we think you’ve found it. Dogs Monthly is definitely not your average Fido when it comes to doggy reads. Packed with tantalising articles achievable training features and no nonsense advice it will warm the heart of every dog lover. You'll receive 12 issues during a 1 year Dogs Monthly magazine subscription. You'll receive 12 issues during a 1 year Dogs Monthly magazine print subscription.